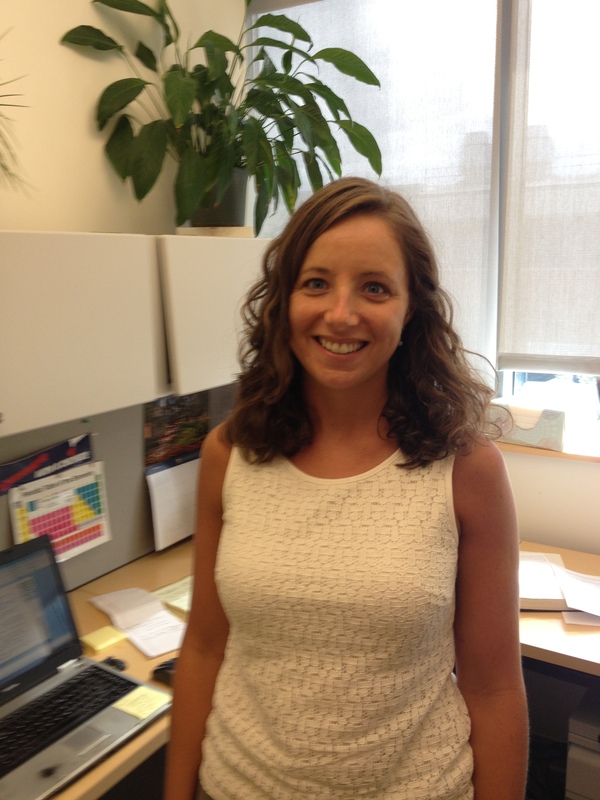 Our guest blogger is Dr. Kate Mullaugh, Assistant Professor in Chemistry. These instructions are based off iMovie version 10.1.2 on a MacBook Pro Laptop. Everyone gets a front row seat! Students can get a quick review if they haven’t performed the task in some time. Videos can easily be replayed if students don’t quite catch everything that is presented the first time around. If different instructors teach multiple sections of a course or lab, you can ensure students are a getting consistent message across all sections. If there are hazards associated with the technique (or being in lab in general), safety can be represented in a way that is consistent with your department’s standards. You can free up time in the classroom or lab for other instruction. Once produced, videos can be used again and again for semesters to come! This can be done using an iPad (on loan from TLT if you don’t have one) or other device. Before you get started make sure you have plenty of free space on the device because the video files will be large. Use some sort of stand (i.e., a stack of books) so your footage isn’t shaky. Have your device in a horizontal orientation. Have a cameraperson. I have done some videos where I set up the camera and record myself, but inevitably something is just out of frame and I have to reshoot. Don’t try worry about sound or narrating what you are doing while you film. As you will see iMovie makes it very easy to edit out sound a record a voice over for videos. Err on the side of capturing too much footage. You can edit it down later. When you plug in your device to your computer, the screen to the right will appear. Select “Import All New Videos.” You probably want to have “Delete items after import” selected, which will help free up storage on the device. You may have to do this periodically if you are trying to capture a lot of footage and your device has limited storage. Open iMovie and go to File  New Movie. You will first be prompted to select a theme. I personally like “Simple” because it does not clutter the screen with busy graphics. Click “Create” and name your project. Drag and drop all files from the “Photos Library” into your new movie on the left panel of the screen (under “Project Media”). If you have still images you want to use, you can do this as well. You can even drag and drop files from a folder in Finder. You are now ready to start building your movie. To do so, select the title under “Project Media” and drag video clips or images to the panel at the bottom in the order you think you want them to appear. Of course this can be changed later. You may need to take care to ensure the whole clip (or portion you want) is highlighted in yellow before dropping it into the bottom panel. As you add elements and make other changes, pay close attention to where the cursor (the vertical line in the bottom panel) is. Also note that the aspect you are editing at any given time will be highlighted with a yellow border. If you need finer control over where you are editing within a video, you can expand it by using the slide bar in the middle of the right side of the iMovie window. You will periodically want to watch your video as you go. To do so, place the cursor where you want to start watching and press play in the viewing panel on the right. I like to start off my movies with a title slide to give them a professional look. To do this I use a still image and over lay it with text. For my series of lab videos I used the same image so they had a consistent theme. When displaying still images, the iMovie default is to use a slow pan for the aptly named “Ken Burns” effect. To change how the still image appears, double click on the picture in the bottom panel. There you will see two rectangles representing the beginning and end shot. You can change these to zoom in or out, or pan across. To simply display the picture or a cropped version of the picture, select “Fit” or “Crop to Fill,” respectively. To add text to your title slide, click on “Title” at the top of the screen. Double click on the version you like (I use Standard) and you will get a warning to turn off automatic content, which I recommend doing to get more flexibility in how the text appears. Double click on the parts of the title you want to change. The amount of time you want to have the title displayed can be controlled by expanding or contracting the purple bar appearing above this segment of the video in iMovie. You may like to do this to for adding a video within another video, which is the same as what I am going to describe here for putting a still image within a still image that is serving as the title slide. I used the C of C logo for my department to give it an official look. You can access C of C logos for departments across campus from the marketing department here. You will need a C of C Google Drive account to access logos. Once you have a picture (or logo) located in a folder, you can drag and drop it into your project in the left panel of iMovie. From the “My Media” panel, drag it down so it lands above to the portion of the video where you want it to appear. Select the picture so it has a yellow border around it. And then select the icon that looks like one solid box with a dashed box behind it. From the drop down menu select “Picture in Picture.” This is also where you find a side-by-side option, which you may find helpful for some other purposes. Just like for the still image, the default is again the Ken Burns effect so you will probably want to select “Fit” instead. You may also have to use the crop icon depending on how much of the image you want to appear. If you took the approach of taking a lot of footage for your video, the bulk of your editing will be cutting stuff out. Once you determine a place where you want to cut something out, place the cursor there and then go to Modify  Split Clip and it will make a cut. Repeat at the end of the section you want to remove. Then select the section of the video you want to remove (outlined in yellow) and hit Delete. You will now have somewhat abrupt transitions from clip to clip. Adding smooth transitions will make the final product look significantly more professional. Go to “Transitions” at the top of the iMovie window. With the cursor in the gap between clips, select your transition by double clicking. I mostly have used “Fade to Black” for subtle transitions, but you might prefer something flashier. With the cursor where you want the text to appear, double click on the type of title that you want to use (I like “Soft Edge”) and double click on the purple box to change the text. You can also edit the justification and font color/size once it is inserted. The default for displaying text is 4 seconds, but you can easily change it by expanding or contracting the purple box. I think about 10 seconds is a good length when it’s a full sentence and the audience is paying close attention to what is happening on screen. Note iMovie will not underline misspelled words so make sure you edit your text! I like to remove all sound from the get go. Knowing that I can add in narration later allows me to focus on getting the best visual footage during filming. Remove audio by selecting a clip, then go to Modify > Detach Audio. The audio will appear as a green rectangle below the corresponding video clip in the lower panel. Select it and hit Delete. With the background sound removed, I record a voice over. Usually I watch the video without sound and write a rough outline of what I want to say as I go. To record narration, make sure the cursor is at the beginning of the video and then I press the microphone icon that is located below and to the left of the video panel (close to the middle of the iMovie window). Then a red circle will appear. Recording will begin after the 3-2-1 count down. You can edit sound clips the same way as the video above. For example, if I know I was sounding good and then I messed up, I can split the clip just before the mess-up (make sure the audio, not the video is highlighted in yellow) and then delete what I don’t want. I can then pick up the recording where I left off by having the cursor in the appropriate position. TLT has various microphones you may use, or your computer may have a decent one built into it. I’ve found that the microphone on the headphones that come with an iPhone works great. You should listen to your recording (it’s painful to hear your own voice, I know!) to make sure it sounds good. This can take some time depending on the length and resolution of your video. I like to save the video as an .mp4 file so that I can upload it directly to OAKS or share it with people in ways other than YouTube, but you can also upload it directly to YouTube from iMovie. See the menu in to the right. Edit the title and description if desired and then click “Next…” to export the file and select the folder where you want it to be saved. Once the export is complete, go to YouTube and click on “Upload.” You will be asked to sign in using your Google username. Then select the file from the folder where you saved it. While it uploads, you can edit the title and description to how you want it to appear. I also like to make videos unlisted so if someone searches for videos they won’t come across what I’ve done. Students will be able to access unlisted videos as long as they are provided with a link. Under advanced settings you can disable comments, which I recommend. Once the processing in complete, click “Done” and the link will be provided. Make sure you copy the link somewhere so you will be able to access it later. A standard approach to this would be to embed the YouTube videos or provide links on your OAKS page. Perhaps a more useful approach that would allow students to readily access the videos “on the fly” while they are in class or lab would be to provide QR codes that can be scanned with a smart phone to access the videos. Once the QR code is generated, you can copy the code then paste it where you want it. QR codes can be scanned from printed pages, on a computer monitor or when projected on a screen. There seems to be a sweet spot of video length that students will watch. If a video is too short (< 2 minutes), students might view it as unimportant and won’t bother. If a video is too long (9+ minutes…yes, really, that is considered too long! ), they may not watch it. So extra effort put into making lengthy videos is likely time wasted! Ask students to “star” in you videos. Students are often excited and flattered to be asked to be in a video. Make a video without sound and ask students to write a script to go along with it, maybe even record their voices narrating it. This gets you out of having to listen to your own voice when editing! Document common mistakes in your videos and ask students to critique what they see. And of course you could always ask students to make their own videos as a project!